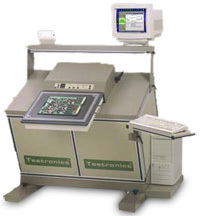 The Testronics 400 Series is the next generation of automatic test equipment delivering high fault coverage, fast throughput, and short programming times. The new platform is an open architecture system designed with a focus on flexibility and upgradability, providing the ability to configure the system as a low cost Manufacturing Defects Analyzer, as an Analog In-Circuit tester, or as a Combinational tester. Every system is field upgradable utilizing a VME plug-n-play style backplane. All systems are designed for quick increases in test points, mix and match of power up switch cards, unpowered low cost switch cards, special application cards, and standard option cards. All standard fixture interfaces are supported, including GR2270, GR2272/2286, Z18XX, connectors, and paddle cards, utilizing vacuum, pneumatics, and mechanical press-down assemblies. The 406A is designed to target the highest number of assembly failures for the least amount of capital equipment cost, programming time, and maintenance costs. The precision Stimulus Measurement Unit provides AC/DC analog measurements that are accurate, stable, repeatable, and reliable. Fault coverage is maximized by using unlimited power, return, and guard points during the measurements. The non-muxed, pure pin, 6-wire switch matrix is configured for high accuracy and easy programming.Low cost industry standard GR2270 vacuum fixture kits interface with the ruggedized 406A receiver. The 406C is an open architecture power up test platform designed to facilitate the implementation of functional testing after the MDA test is completed. Dubbed "Armadillo," the new internal architecture provides the user almost unlimited flexibility by combining the best of the VME buss and a dedicated ICT buss. The 406C comes as a basic platform with your choice of receivers interfaces. GR2270 for a maximum of 1600 test points, GR2272/2286 for a maximum of 3840 test points,and Teradyne Z1800 for a maximum of 2048 test points.An ergonomically designed tilt cabinet houses the complete system. Switch cards can be mixed and matched based on your applications. Solid State Switches and Reed Relays can be combined to offer low a cost package, and still meet the application requirements. Custom features, application specific circuitry, IEEE, and VXI instrumentation can be easily integrated into the 406C for power-up functional testing. For personal assistance regarding this series, or any Testronic product, call 1-972-542-3111, email info@testronics.com, or click the link provided below.